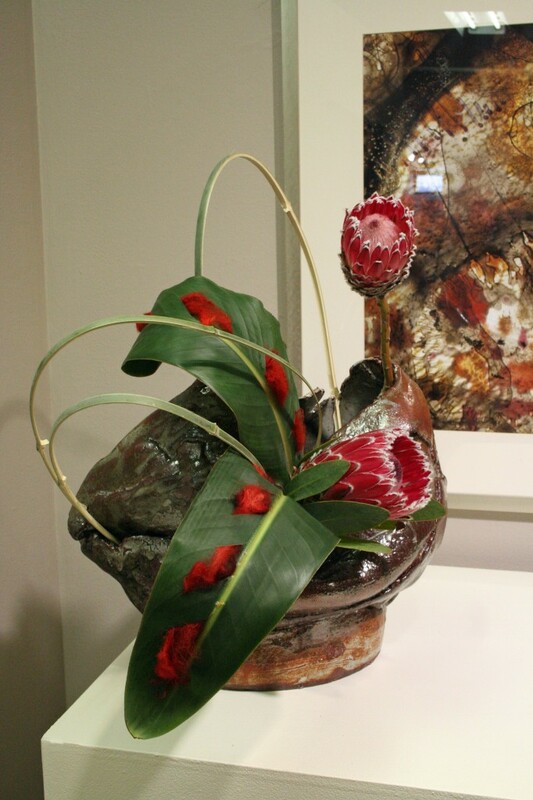 Thursday night The Art League Galley opened the Biennial Ikebana Exhibition featuring works of art by Art League artists paired with ikebana artists from the Washington, DC Sogetsu Ikebana branch. Frederick and I went to Alexandria to install my piece in the afternoon, most of the other ikebana artists were done and my spot was ready and waiting for me to work. I choose a ceramic piece by Carla Amerau (who is also a very accomplished Sogetsu ikebana artist as well) and an intriguing photography piece by Erin Tetterton. Both of their pieces had very organic feel to them, and I was very pleased with how well they worked together. For my ikebana arrangement in the exhibition I choose some pink mink proteas, split bamboo, and some bird of paradise leaves that I wove with strips of red colored wool. After the installation we had dinner and came back for the opening which was really wonderful, a great chance to talk, view all the work and meet other artists too. This exhibition is up thru Sunday March 9th and I hope that you get a chance to go to Alexandria to see it! What a beautiful arrangement and what an honor to be part of the show! 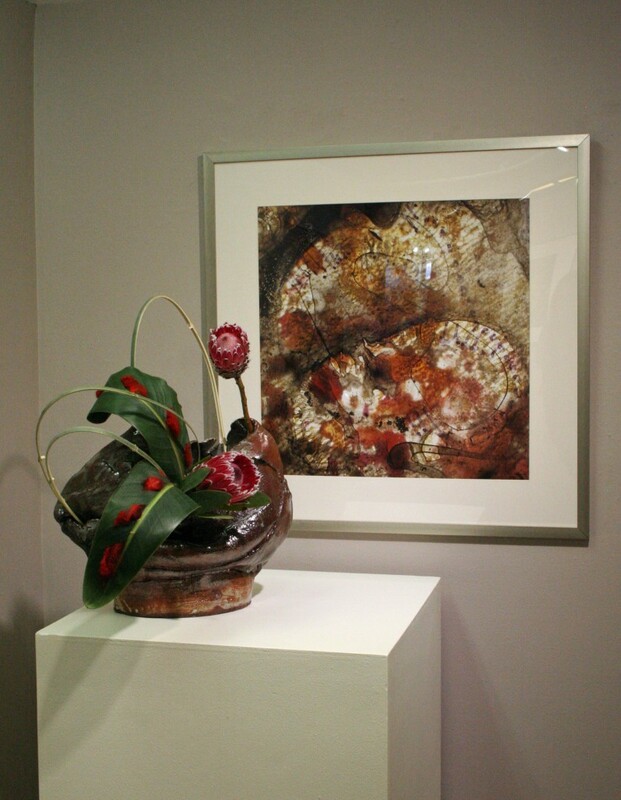 It’s so nice to see the flowers with art about nature and your simple design brings a fresh feeling to the gallery indoors. I did not make it down to see the show and am happy to see your photos. What a fantastic choice of vase! It works beautifully with your photo in scale, texture, form and color. I like how well the scale of your greenery plays with both vase and photo, the large leaves and linear bamboo. The colored wool woven through the leaves was an inspired touch! Well done! Many thanks to you George and The Art League Gallery for such a great exhibition!!!! !